Hello everyone! Today, I have some fun dangle earrings to share with you. 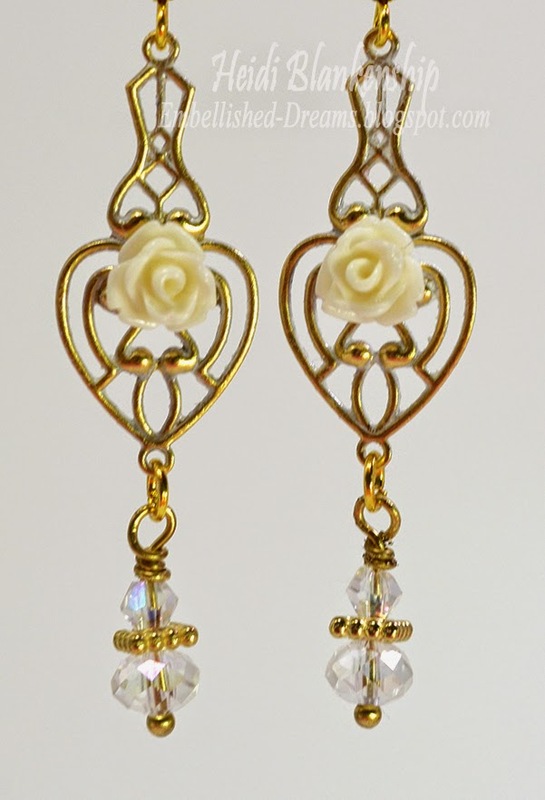 I made three pairs of earrings and all of the brass filigree pieces are from ButterBeeScraps. I wanted to tone the brass down just a little bit on the filigree pieces so I added some Antique White Rub'n Buff on all of the pieces. Then I added some resin flowers to each piece and create bead dangles to match. Here is the first pair of earrings. 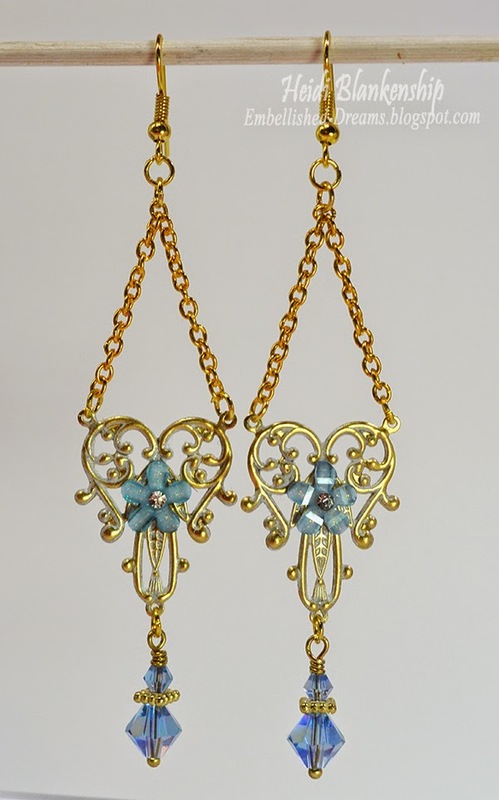 For these I used Brass Filigree Embellishment (Item #946-G). Then I added some tiny blue acrylic flowers with a rhinestone centers to the filigree piece. On the top half I added some brass chain and for the bottom I added a beaded dangles. The second pair of earring is the smallest of the three pairs. 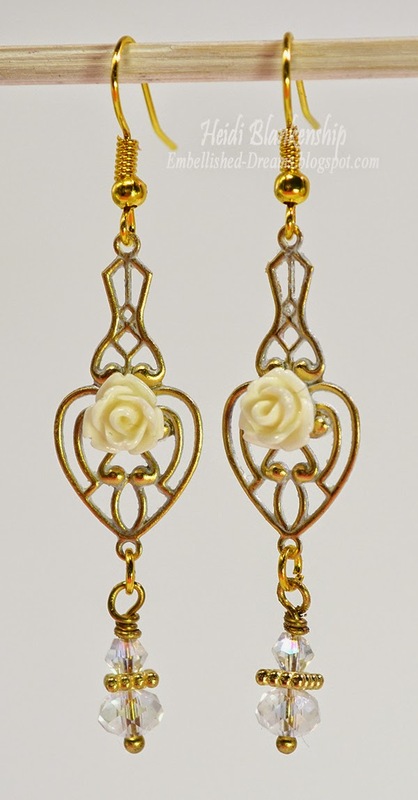 I used Brass Filigree Embellishment (Item #948-G) and added ivory resin roses to the center of the filigree pieces. Then I added crystal bead dangles. 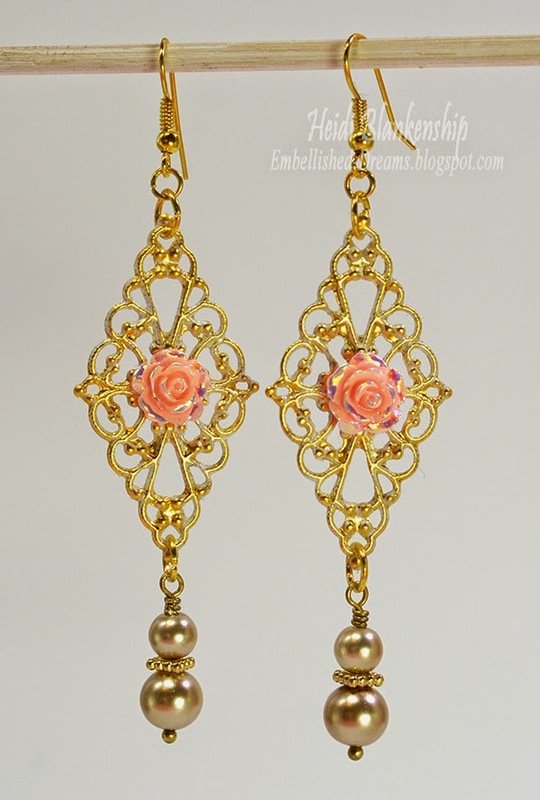 Love the pretty pink AB roses on these earrings. 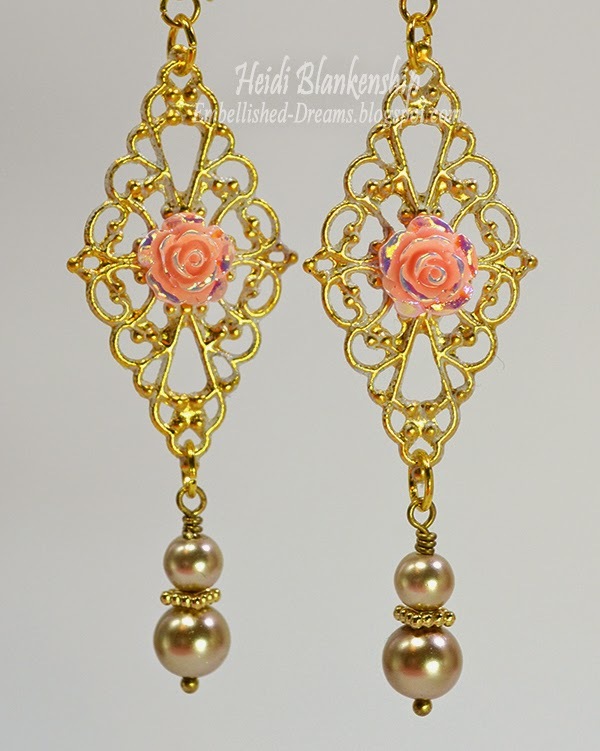 I used the Brass Filigree Embellishment (Item #003-G) and added the pink resin rose to the center. Then I created pearl dangles to add to the bottom of the earrings. 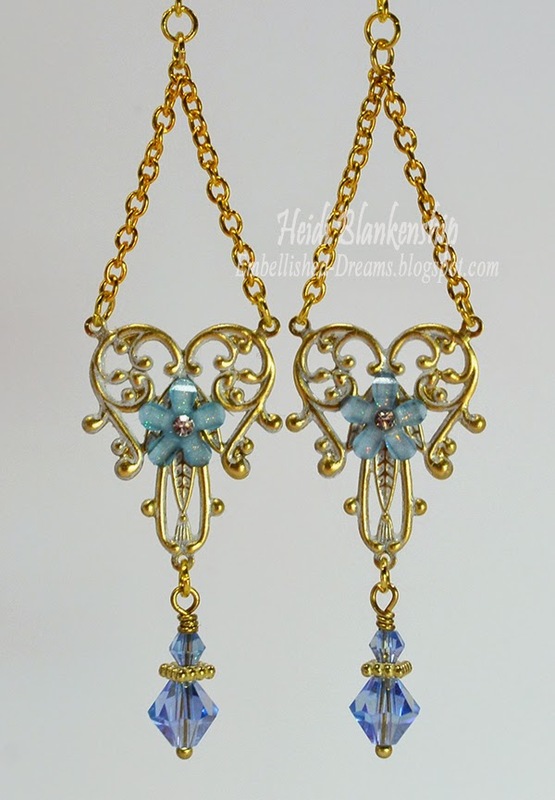 I also used Bronze Ball End Head Pins on all of the earrings to create the beaded dangles. I hope you enjoyed all of the earrings. They were pretty quick and easy to create. Please be sure to check out ButterBeeScraps for all kinds of metal filigrees, charms and crystals. Lots of fun pieces to create jewelry and all to use as embellishments. 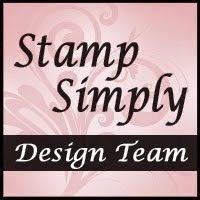 If you are looking for some fantastic deals Monique, owner of ButterBeeScraps just added several fun Grab Bags to the store. I love them all. I wish I had an eye for the earrings like my daughter does. These are lovely! 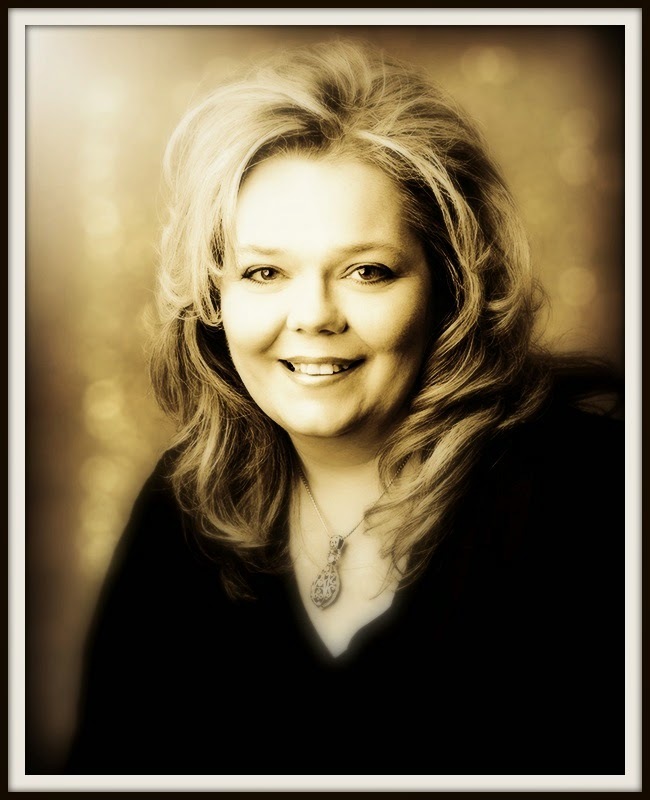 Seasons Giving Blog Hop Winners! !